Earlier this year, in January, an American fencer booked herself a spot in the Rio Olympic Games, scheduled to be held in August. The said fencer secured the requisite qualifying points during an event in Athens to clinch her place in the USA Olympics' team. This wouldn't normally warrant coverage from the American press, but this is no ordinary athlete. Ibtihaj Muhammad's hijab makes her stand out from the crowd. It is a symbol of her identity, her uniqueness. Come August, the African-American athlete will become the first Olympian from the country to wear a hijab at the Games. For a country whose relationship with Islam continues to be under scrutiny, the significance of Muhammad's qualification cannot be downplayed. 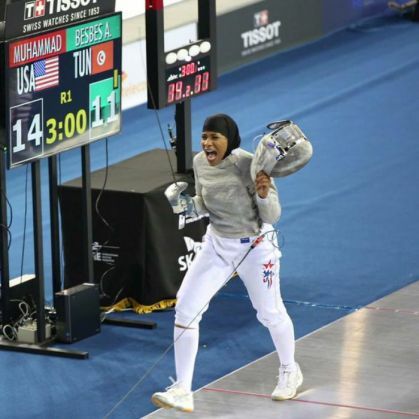 A recent interview with Time magazine sheds new light on Ibtihaj Muhammad's life. She is a saber fencer, saber being one of the three forms of the sport. However, what makes for an interesting read is how she took up the sport as a kid. Being a devout Muslim, she admits to feeling ostracised from other kids of her age when she went out with her head draped in a hijab, and with her hands and legs fully-clothed. "When we think about the concept of a uniform, this sense of camaraderie that can be built around wearing the same thing, I don't think I was able to capture that as a kid," she says in the interview. When her mother Denise noticed a group of young fencers at a traffic signal, Ibtihaj Muhammad's life changed. Fencing, which requires the athlete to be fully covered with protective gear, seemed like the perfect sport for Denise's athletic daughter. However, as Muhammad found out, her initial years in the sport were far from easy. "Parents asking whether or not it was OK for me to fence in my hijab, if in some way it would jeopardise someone else's safety. As a child, that can be kind of traumatising," she tells Time. The young athlete went on to undertake training under Peter Westbrook, who had won a bronze medal at the 1984 Olympics. Westbrook had trained a number of kids from nontraditional fencing backgrounds over the years and had developed a reputation for it. After quickly progressing under Westbrook's guidance, she received a partial academic scholarship from the University of Duke, before finally turning professional. "There are tons of Muslim-clothing companies out there. But I felt as though they were never anything me or my sisters or my friends would wear. They're, like, dowdy and dark," says Muhammad. In 2014, the fencer founded Louella, named after her grandmother. The company now caters to what is termed as the 'modest fashion' industry in the USA, with Muslim women being the primary customer group. Supported by her brother Qareeb, the company runs from the West Coast. "I know very few women who wear burqas and black. But when Americans think of who a Muslim woman is, that's the first thing they probably think. "It's OK to wear a hijab and be different and challenge these norms, these misconceptions of who we are," she affirms. Donald Trump's candidacy for the Republican nomination for the upcoming presidential elections has generated fears among the country's Muslims. During his election campaign, Trump hasn't stepped back from the use of Islamophobic rhetoric to garner support from the country's far-right. Ibtihaj Muhammad remains confident that Americans wouldn't let the business tycoon take over the reins at White House, but she confesses to being fearful over the hatred being spread over the course of the campaign. "When you incite hateful speech and rhetoric like that, the people who say it never think about the repercussions and how that affects Muslims. Specifically Muslim women who wear their religion every single day. So then you start to think, Am I going to be safe?" she says. "I still have faith in the greater America that we will not vote someone as ignorant as Donald Trump into office. As a country, we are collectively more intelligent than that. I think he represents everything we aren't," she adds. Taking a shot at Trump's 'Make America great again' campaign slogan, she says, "That you have minorities who for so long have been oppressed, who for so long have been confined to particular spaces breaking out of these norms and breaking barriers - that's what makes America great." Muhammad, who had narrowly missed out on qualification to the 2012 Olympics, will finally get her shot at glory later this year. However, irrespective of what happens in Rio, her appearance at the Games makes for a great story in itself. Lost power, farm distress: what's really driving the #JatQuotaStir?